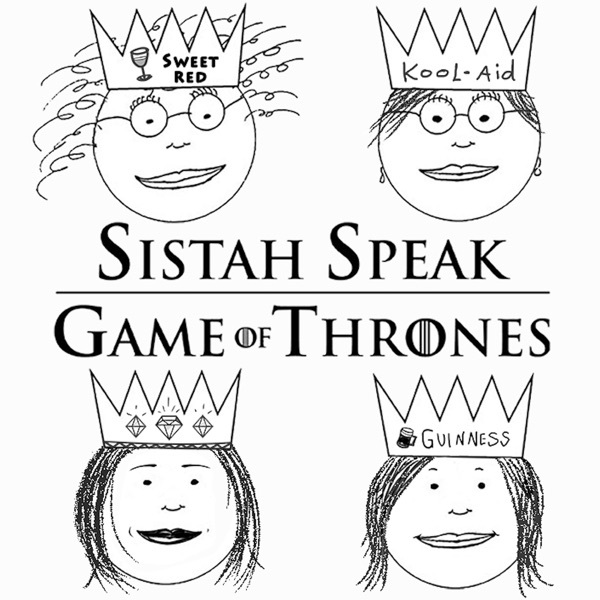 Sistah Speak: Game of Thrones is a podcast devoted to the HBO series, Game of Thrones. Sistah J and Sistah K discuss the latest episodes, theories raised by fans of the show, and give their personal opinions from a Sistah’s point of view. Y'all know how we do! Join us as we discuss the Game of Thrones season seven finale entitled, “The Dragon and the Wolf”. Join us as we discuss the Game of Thrones season five finale entitled “Mother’s Mercy”. Follow us on Twitter @SistahSpeakCast @_SistahJ @_SistahK! Love the podcast? Tweet and let others know! Get your Sistah Speak Apparel now at the Sistah Speak Shop! Email your feedback to sistahspeak@gmail.com or leave a voicemail at SpeakPipe.com/SistahSpeak or 972-755-1215. Join us as we discuss the Game of Thrones season five episode nine entitled “The Dance of Dragons”. Follow us on Twitter @SistahSpeakCast @_SistahJ @_SistahK! Love the podcast? Tweet and let others know! Get your Sistah Speak Apparel now at the Sistah Speak Shop! Email your feedback to sistahspeak@gmail.com or leave a voicemail at SpeakPipe.com/SistahSpeak or 972-755-1215. Join us as we discuss the Game of Thrones season five episode eight entitled “Hardhome”. Follow us on Twitter @SistahSpeakCast @_SistahJ @_SistahK! Love the podcast? Tweet and let others know! Get your Sistah Speak Apparel now at the Sistah Speak Shop! Email your feedback to sistahspeak@gmail.com or leave a voicemail at SpeakPipe.com/SistahSpeak or 972-755-1215. Join us as we discuss the Game of Thrones season five episode seven entitled “The Gift”. Follow us on Twitter @SistahSpeakCast @_SistahJ @_SistahK! Love the podcast? Tweet and let others know! Get your Sistah Speak Apparel now at the Sistah Speak Shop! Email your feedback to sistahspeak@gmail.com or leave a voicemail at SpeakPipe.com/SistahSpeak or 972-755-1215. Join us as we discuss the Game of Thrones season five episode six entitled “Unbound, Unbent, Unbroken”. Follow us on Twitter @SistahSpeakCast @_SistahJ @_SistahK! Love the podcast? Tweet and let others know! Get your Sistah Speak Apparel now at the Sistah Speak Shop! Email your feedback to sistahspeak@gmail.com or leave a voicemail at SpeakPipe.com/SistahSpeak or 972-755-1215. Join us as we discuss the Game of Thrones season five episode five entitled “Kill the Boy”. Follow us on Twitter @SistahSpeakCast @_SistahJ @_SistahK! Love the podcast? Tweet and let others know! Get your Sistah Speak Apparel now at the Sistah Speak Shop! Email your feedback to sistahspeak@gmail.com or leave a voicemail at 972-755-1215. Join us as we discuss the Game of Thrones season five episode four entitled “Sons of the Harpy”. Follow us on Twitter @SistahSpeakCast @_SistahJ @_SistahK! Love the podcast? Tweet and let others know! Get your Sistah Speak Apparel now at the Sistah Speak Shop! Email your feedback to sistahspeak@gmail.com or leave a voicemail at 972-755-1215. Join us as we discuss the Game of Thrones season five episode three entitled “High Sparrow”. Follow us on Twitter @SistahSpeakCast @_SistahJ @_SistahK! Love the podcast? Tweet and let others know! Get your Sistah Speak Apparel now at the Sistah Speak Shop! Email your feedback to sistahspeak@gmail.com or leave a voicemail at 972-755-1215. Join us as we discuss the Game of Thrones season five episode two entitled “The House of Black and White”. Follow us on Twitter @SistahSpeakCast @_SistahJ @_SistahK! Love the podcast? Tweet and let others know! Get your Sistah Speak Apparel now at the Sistah Speak Shop! Email your feedback to sistahspeak@gmail.com or leave a voicemail at 972-755-1215. Join us as we discuss the Game of Thrones season five premiere entitled “The Wars to Come”. Follow us on Twitter @SistahSpeakCast @_SistahJ @_SistahK! Love the podcast? Tweet and let others know! Get your Sistah Speak Apparel now at the Sistah Speak Shop! Email your feedback to sistahspeak@gmail.com or leave a voicemail at 972-755-1215. Join us as we discuss Game of Thrones season four finale entitled, “The Children”. Love the podcast? Help spread the word by sending a Tweet for us! Get your Sistah Speak Apparel now at the Sistah Speak Shop! Email your feedback to sistahspeak@gmail.com or leave a voicemail at 972-755-1215. Join us as we discuss Game of Thrones season four episode nine entitled, “The Watchers on the Wall”. Love the podcast? Help spread the word by sending a Tweet for us! Get your Sistah Speak Apparel now at the Sistah Speak Shop! Email your feedback to sistahspeak@gmail.com or leave a voicemail at 972-755-1215. Join us as we discuss Game of Thrones season four episode eight entitled, “The Mountain and the Viper”. Love the podcast? Help spread the word by sending a Tweet for us! Get your Sistah Speak Apparel now at the Sistah Speak Shop! Email your feedback to sistahspeak@gmail.com or leave a voicemail at 972-755-1215. Join us as we discuss Game of Thrones season four episode seven entitled, “Mockingbird”. Love the podcast? Help spread the word by sending a Tweet for us! Get your Sistah Speak Apparel now at the Sistah Speak Shop! Email your feedback to sistahspeak@gmail.com or leave a voicemail at 972-755-1215. Join us as we discuss Game of Thrones season four episode six entitled, “The Laws of Gods and Men”. Love the podcast? Help spread the word by sending a Tweet for us! Get your Sistah Speak Apparel now at the Sistah Speak Shop! Email your feedback to sistahspeak@gmail.com or leave a voicemail at 972-755-1215. Join us as we discuss Game of Thrones season four episode five entitled, “First of His Name”. Love the podcast? Help spread the word by sending a Tweet for us! Get your Sistah Speak Apparel now at the Sistah Speak Shop! Email your feedback to sistahspeak@gmail.com or leave a voicemail at 972-755-1215. Join us as we discuss Game of Thrones season four episode four entitled, “Oathkeeper”. Love the podcast? Help spread the word by sending a Tweet for us! Get your Sistah Speak Apparel now at the Sistah Speak Shop! Email your feedback to sistahspeak@gmail.com or leave a voicemail at 972-755-1215. Join us as we discuss Game of Thrones season four episode three entitled, “Breaker of Chains”. Love the podcast? Help spread the word by sending a Tweet for us! Get your Sistah Speak Apparel now at the Sistah Speak Shop! Email your feedback to sistahspeak@gmail.com or leave a voicemail at 972-755-1215. Join us as we discuss the Game of Thrones season three finale entitled, “Mhysa” Part II and check out more of the Sistahs in our interview with www.ProjectFandom.com. Join us as we discuss the Game of Thrones season three finale entitled, “Mhysa” Part I and check out more of the Sistahs in our interview with www.ProjectFandom.com. Join us as we discuss the Game of Thrones season three episode nine entitled, “The Rains of Castamere” Part II. We had to break the podcast in two so be sure to download both parts. Join us as we discuss the Game of Thrones season three episode nine entitled, “The Rains of Castamere” Part I. We had to break the podcast in two so be sure to download both parts. Join us as we discuss the Game of Thrones season three episode eight entitled, “Second Sons”. Join us as we discuss the Game of Thrones season three episode seven entitled, “The Bear and The Maiden Fair”. Join us as we discuss the Game of Thrones season three episode six entitled, “The Climb”. Join us as we discuss the Game of Thrones season three episode five entitled, “Kissed By Fire”. Join us as we discuss the Game of Thrones season three episode four entitled, “And Now His Watch Is Ended”. Also, help our podcast friends, Geek Girl Soup, with a fundraiser for a friend in need at www.facebook.com/HelpMaryAnneKickCancer. Join us as we discuss the Game of Thrones season three episode three entitled, “Walk of Punishment”. Join us as we discuss the Game of Thrones season three episode two entitled, “Dark Wings, Dark Words”. Join us as we discuss the Game of Thrones season three premiere entitled, “Valar Dohaeris”. Join us as we discuss the Game of Thrones season two finale entitled, “Valar Morghulis”. Join us as we discuss the Game of Thrones season two episode nine entitled, “Blackwater”. We also announce the winner of our second feedback contest! Join us as we discuss the Game of Thrones season two episode eight entitled, “The Prince of Winterfell”. Remember the deadline for the feedback contest is May 31 so send us your comments. Join us as we discuss the Game of Thrones season two episode seven entitled, “A Man Without Honor”. We are launching a new feedback contest with one small rule change…iTunes reviews will now count as two entries in the drawing. The deadline is 5pm CT on Thursday, May 31. Good luck! Join us as we discuss the Game of Thrones season two episode six entitled, “The Old Gods and the New”. Join us as we discuss the Game of Thrones season two episode five entitled, “The Ghost of Harrenhal”. Join us as we discuss the Game of Thrones season two episode four entitled, “Garden of Bones”. Join us as we discuss the Game of Thrones season two episode three entitled, “What Is Dead May Never Die”. Join us as we discuss the Game of Thrones season two episode two entitled, “The Night Lands”. Join us as we discuss the Game of Thrones season two premiere entitled, “The North Remembers”. The Sistahs are back! Join us as we discuss season one of the HBO series Game of Thrones in preparation for the season two premiere.